A MQ-9 Reaper drone being flown during exercises at Creech Air Force Base in Nevada, 2015. 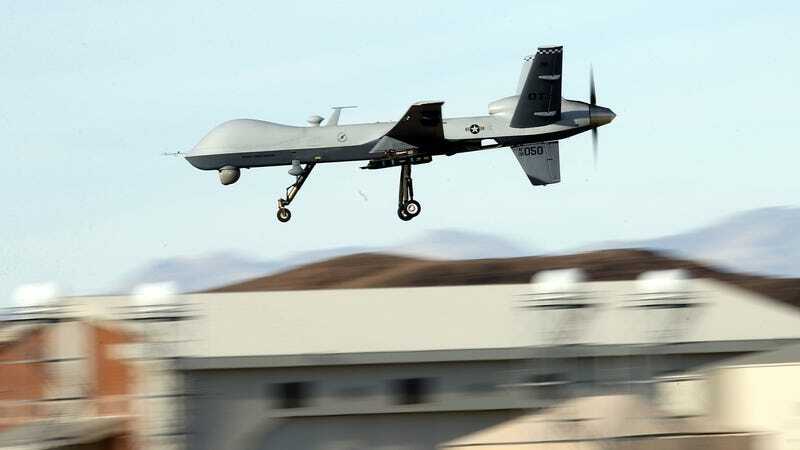 The U.S. government wants to deploy MQ-9 Reaper drones to the border with Mexico as part of the Donald Trump administration’s ongoing and completely unnecessary militarization of the region, TYT Network reported on Wednesday. Yes, those Reaper drones, the remotely piloted aircraft best known for their role in the U.S.’ ongoing, devastating bombing and “targeted killing” campaigns in the never-ending War on Terror. McGuire also alluded to the benefits that not just the Reaper would confer on patrolling the border, but also Apache attack helicopters. “While we are using RC-26 and Lakota, there are other rotary wing and remotely piloted systems like MQ-9 and Apache that could be used in night, low-visibility to help support our Customs and Border Patrol agents out of the normal daytime cycle,” said General McGuire. The drones would be primarily used in intelligence and surveillance operations, National Guard and Border Patrol officials told the committee, though they did not mention whether the aircraft would be armed. Reapers are capable of carrying far larger surveillance payloads than their predecessor, the MQ-1 Predator drone, according to the Register. Legally, guard personnel deployed to the border region are only allowed to provide support for domestic law enforcement agencies, which includes aerial surveillance. TYT Network wrote that the generals did note that any use of the Reaper would need to be cleared by the departments of Defense and Homeland Security. A U.S. Air Force spokesperson told TYT Network they were not aware of any plans to deploy the aircraft, so it’s possible this idea was nipped in the bud by someone wary of the Reaper’s “hunter-killer” reputation or failed to gain approval. It’s also unclear whether the Guard came up with this idea themselves or the Trump administration is pushing for it, though in either scenario the president would doubtless be pleased to hear about more military hardware on border.